Kai is known for their high quality Kai Shun kitchen knives. Wasabi Black – polished blade, black handle: these Japanese designed knives feature a stainless steel polished blade with a hardness of 56±1 HRC that lend your kitchen the unmistakable Far Eastern flair. The Kai Wasabi series is also gives great quality, but is a bit more affordable. Because these knives don’t have a bolster the whole edge can be used and the entire length can be sharpened. In contrast to the traditional Japanese wood handle the black handle is not inserted but embraces the blade completely. Thus the blade is closely connected to the handle, not allowing dirt to settle in any gaps. The handle is made out of a combination of bamboo powder and polypropylene - the bamboo have natural antibacterial feature. This makes it durable and waterproof. Steak knife.Overall length: 24.6 cmHandle length: 12.6 cmBlade length: 12 cmBlade: double ..
Utility knife.Overall length: 27.6 cmHandle length: 12.6 cmBlade length: 15 cmBlade t.. 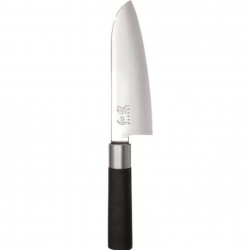 Chef's Knife.Overall length: 27.6 cmHandle length: 12.6 cmBlade length: 15 cmWeight: .. Chef's knife.Overall length: 32.6 cmHandle length: 12.6 cmBlade length: 20 cmBlade th.. Chef's knife.Overall length: 36.1 cmHandle length: 12.6 cmBlade length: 23.5 cmBlade:..
Slicing knife.Overall length: 30.6 cmHandle length: 12.6 cmBlade length: 18 cmBlade: .. Bread knife.Overall length: 35.6 cmHandle length: 12.6 cmBlade length: 23 cmWeight:&n..
Slicing knife.Overall length: 35.6 cmHandle length: 12.6 cmBlade length: 23 cmBlade t..